I love sharing Australia with my readers. My books are set in Australia, and I like to include native birds and animals in my stories. In The Bridesmaid’s Hero, my new novella in the Love Blossoms box set, I introduce my readers to Finn the magpie. Finn is loosely based on the family of magpies who live near my home. Bill is a friendly magpie. When he was a juvenile we used to see him all the time. Magpies are territorial, and the babies usually grow up and leave their home territory. Bill moved on last year, and my children see him at their school which is a mile away from our home. Bill occasionally visits, and he has a sweet tooth. We once caught Bill eating a chocolate chip cookie that my daughter had left outside. Bill wasn’t impressed when we took the cookie away from him and replaced it with sunflowers seeds. Clive is Bill’s younger brother. 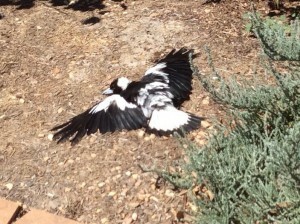 He was a cute baby magpie who liked showing off his feathers (see the photos below). Clive also migrated to a territory near the school. He’s now bigger than Bill and is known for eating junk food left in the playground by students. My daughter was impressed to see Clive eating a discarded apple today. Clive, when he was a juvenile, showing off his feathers. No-Beaky is Bill and Clive’s mother. She’s a lovely bird who is missing half of her top beak. She has the best voice and sings amazing carols. She also has a distinctive cry that she projects through our neighbourhood about half an hour before it starts raining. I know when I need to bring in the clothes from our outside line. No-Beaky, the mother who is missing half of her top beak. We call the father magpie ‘Invader’ because he’s not as friendly as the rest of the family. During Spring last year, when the latest group of babies were in a nearby nest, Invader had a big testosterone burst and his swooping activities reached new heights. He gained a reputation in our neighbourhood and the Rangers placed signs (see below) on lamp posts near our home. The Rangers discovered three babies in a nest in a tall gum tree with Invader and No-Beaky, but only two of the babies have survived. We’ve called one of the babies ‘Whiney’ because he or she cries all the time. 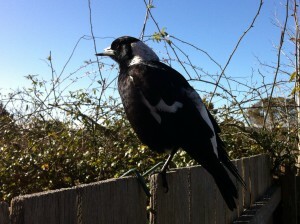 Whiney is an anxious magpie and a parenting challenge for Invader and No-Beaky. The other baby is more independent and rarely cries like Whiney. No-Beaky and Invader are from different magpie breeds. No-Beaky is taller and broader than Invader. Whiney is already bigger than Invader, and the babies still have their gray feathers. 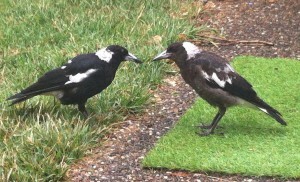 Invader (the father) is on the left and he feeds earthworms to Whiney by placing them in the baby magpie’s beak. 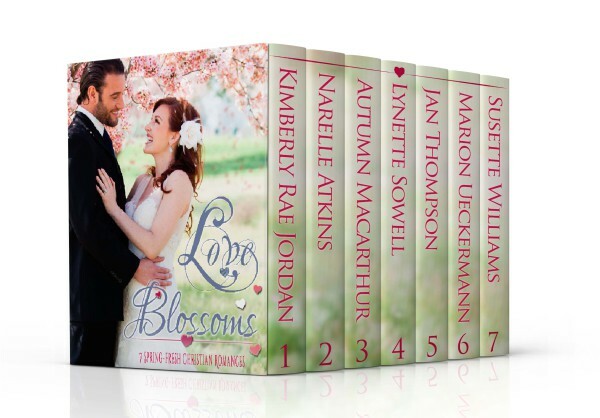 Today I’m giving away an Amazon Kindle copy of the Love Blossoms box set to a reader who leaves a comment on this post. The giveaway will close on Friday night (US time) and the winner will be announced in the Sunday Edition on Valentine’s Day. Pastry chef Serena Blaxland isn’t staying in the small Australian town of Snowgum Creek. She’s there for her sister’s wedding, and to help out at the family B&B until her mother’s arm heals. Sparks fly when the handsome driver of their bridal car saves Serena from disrupting her sister’s perfect wedding day. Harry Westmore’s dream of becoming an equine vet was put on hold when his father passed away. He’s working several jobs in his home town to pay his bills and prepare for his future career. He can’t stay away from the beautiful chef when he visits the B&B each day to look after her mother’s horses. Serena’s home is in Canberra, where she has built a successful career. When Harry’s offered an opportunity too good to refuse, they must decide if their love and faith can overcome all obstacles. The Bridesmaid’s Hero is a standalone novella and Book 1.5 in the Snowgum Creek series. 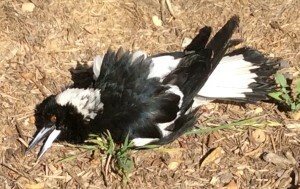 When I was at the Adelaide Zoo I was talking to someone who work with birds and mentioning how the magpies were putting their wings out in the dirt. He said its so the ants can eat off the mites or other insects on them and is used to help keep theam well groomed. 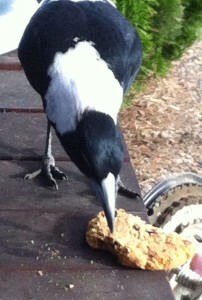 Hi Jenny, Clive is the only magpie I’ve ever seen do this with his feathers. It makes sense that there’s a biological reason because they’re more vulnerable to predators when they’re on the ground. I have seen the Beware! Swooping Birds sign quite often. Cute names for your Magpie family:). Hi Lientjie, My children named the magpies :) It’s helpful that the rangers post the warning signs, especially for cyclists who are often targeted by the swooping birds. I just read two stories from Love Blossoms yesterday and really enjoyed it. I loved seeing the pictures and hearing about the birds. I feed birds in Virginia, . USA, but we haven’t seen magpies! I’ll have to look up the Snowgum Creek series. God bless! Hi dlw, I’m glad you’re enjoying the stories in Love Blossoms :) The magpies would make their presence known if they were nearby! I loved seeing squirrels when I visited WA a few years ago. Love the post and pix of magpies! I remember when I moved from Ohio to Colorado and saw my first magpie. I was so excited I was practically jumping up and down, thinking it was an exotic and rare bird. My Colorado friends just shook their heads… and I soon learned that they are abundant and often considered pests. I never grew to see them that way, though. And I never knew they were common in Australia. Thanks for the fun post! Hi Lee, The swooping activity during breeding season does give them a bad reputation. Interestingly, the swooping stops as soon as the babies leave the nest. Apparently it’s all driven by hormones. 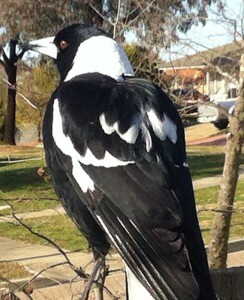 Magpies are very common where I live in Canberra because we have a lot of established gum trees in our neighbourhood. That sign is amazing! I’ve never seen a sign like that. Also, I did not know much about magpies. Thanks for sharing the information. The story looks great. I want to read it. I was so worried the birds all spread out on the ground were dead! They seem to be full of character! Thanks for the chance to win the Love Blossoms collection. Hi Beth, I thought the same thing the first time I saw Clive lying on the ground. I was so relieved when he moved his head :) I hope you’ll have a chance to read Love Blossoms. Love the “try a different route next time” sign! Sounds like a good collection of stories! Thanks for the chance to win! I enjoy reading about far away places like Australia – thanks for sharing! I loved the markings on the birds in your pictures, but I have to confess, Robins are my favorite. How fun – such personality in those birds! And the swooping sign is neat! Can’t wait to read your latest – it’s in my kindle, but my TBR pile is bigger than my reading time right now! Hi Elizabeth, Your Kindle tbr list sounds like mine – too many books and not enough time :) The magpies definitely have personality, and some are more social than others. No Swooping, love that. Book sounds great, I haven’t read any by these authors. I remember going on vacation on a small island in Hong Kong. The magpies woke us up with their LOUD cries long before we were ready to wake up! Hi Margaret, Yes, the magpies near us wake at sunrise and start singing :) I’m sorry you were woken by a crying bird. It’s frustrating when you’re on vacation and don’t need to be woken at dawn. I’ve never seen a sign warning about birds although I know a few places where they would come in handy. 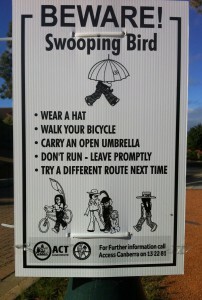 Hi Merrillee, The rangers are fast to act on swooping bird reports and post the signs because of the injury risk. It’s helpful to know where the nests are and which gum trees to avoid. Often crossing the road is all you need to do. Invader was swooping in a large territory of around half a mile. He was difficult to avoid. Sometimes you could get lucky and he’d be preoccupied swooping someone else and miss seeing you. Narelle, how fascinating that you can tell all those birds apart! Maybe I’m oblivious here–or inside too much?–but I can’t tell one cardinal or bluejay from the other. Narelle..I really enjoyed learning about the magpies. . I have never seen one.The sign was very clever. I have Love Blossoms on my Kindle TBR group. Never enough time to get all of them read. 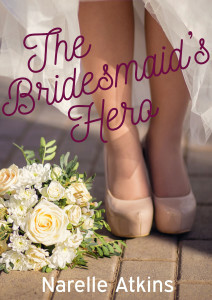 Looking forward to reading The Bridemaid’s Hero. Hi Nancy, I hope you’ll one day have a chance to see a friendly magpie. Enjoy reading the stories in Love Blossoms :) I need to figure out a way to find more reading time, too. Oh my I thought Clive on the ground was dead! He seems like such a ham :-) Thanks for sharing your magpie family. When we lived in Illinois for a couple of years (2006-2008), we had several squirrels & two chipmunks who quickly learned that I put out peanuts for them to snack on. Yes, each one had a name as well :-) They would come at my kissy noises because they learned that was the time I had peanuts for them. The chipmunk couple took a little longer to be unafraid of me, but one of them got to the point where he/she would sit on the bottom step of our front porch and eat while I talked to him/her. I hope the people who bought the house after we moved back to Oregon feed them! Sure do miss seeing them. The boxed set of books looks really good, thank you for the chance to win them! Hi Trixi, Yes, Clive is a character. We’ve often wondered if he’s visually impaired because he’s also clumsy and his co-ordination isn’t as good as the other birds. Wow – your squirrels and chipmunks sound adorable :) I hope the new owners looked after them. I’d love to see a chipmunk. We’re visiting Hawaii and Oregon next month for a family vacation, so we may get lucky? Narelle, I love all of the photos. But I’m dying to know the name of Whiney’s sibling. And I think it’s amazing that No-Beaky sings so beautifully with part of her beak missing! I enjoy reading your blogs about things in Australia. I don’t live there so is very interesting to me.